Did you know that FOOD WASTE is one of the biggest items taking up space in our landfills? According to the New York Times, the US alone wastes $160 billion dollars in food each year. This figure is one that really upsets me. Considering how many people are under-nourished or living in poverty or need a better education- we shouldn’t be wasting food. Are you wondering,” but doesn’t food just degrade in the landfill no problem?” Once the food gets to the landfill it is mixed with tons of other junk, which packs down the food and prevents it from getting oxygen which it needs to break down properly into the soil. The food waste then ends up emitting methane gas. Methane gas is a known greenhouse gas which adds to the effects of climate change. Landfills are the 3rd largest source of methane gas currently in the US. Now, I’m no expert or scientist but here are 5 tips that have helped me to personally reduce my food waste! Lots of sources online say to meal plan & shop every 2-3 days so you aren’t buying things you don’t need or won’t use before they go bad. However, this really isn’t possible for us. For time and convenience sake we really don’t run to the grocery store at night after work so most of our shopping is done on the weekends. If shopping every couple days is an option for you or if you have a nearby grocery store then I think this tip could help! I’ve started keeping a running list (paper list in the kitchen) of pantry essentials and when something is low or we use it all up, I’ll write it on the list to get next time I’m at the store. This helps keep somewhat of an inventory of pantry items that can help put a meal together in a pinch. Another tip we’ve found helpful is to have a shared note (iPhone notes or Google keep) with you and your partner or roommates, of meals or recipes you love to make so you can quickly reference the ingredients required. (Avoiding the dreaded long food-blog post to get to the recipe at the bottom sometimes takes too long when all those images are loading!) You could even have a food schedule in the note to help you keep organized and know what you’re having and when. This one might be controversial because it is true that as you expose fruits/veggies to more oxygen, the faster they will go bad. BUT, I find that if I wash, dry, and prep veggies for whatever we are planning to use them for I’m WAY more likely to use them. A few months ago I started following Brown Kids on Instagram and I quickly became obsessed. I purchased their digital course called The Jar Method and it’s awesome. It teaches you how to prep and store all kinds of food in glass jars to make them last SUPER long and save on food waste and money waste! Harness your inner Samin Nosrat, Gordon Ramsay or Carla Hall or whatever chef you identify with and be able to substitute something or modify a recipe to use what you’ve got. I know, I know, you’re like wait Annie you just told me to meal plan now you’re telling me not to be exact? Hear me out- sometimes Sam and I have already made the meals we planned on making for the beginning part of the week and now we have to wing-it (or got back to the grocery store) and use what we have left in the pantry/fridge. My perfect example of this is just a good ol’ stir fry. We usually always have rice on hand, some sort of bean or maybe some leftover chicken, and whatever veggies are left in the fridge we chop up and use. Or if you’re making a recipe and it calls for spinach but you have a little kale left over, use the kale and don’t buy spinach. Toppings call for chopped cashews but you only have peanuts? Use the peanuts. Use quinoa or frozen cauliflower rice instead of regular rice. The point is, don’t be afraid to be a little creative to use the things you have on hand. As I’m currently obsessed with Samin Nostrat and Salt, Fat, Acid, Heat, I highly recommend you watch the documentary series or get the cookbook and try to learn about these different elements of good cooking. I think this is truly the secret to being able to “wing it” in the kitchen. I’m currently on the “Fat” chapter so I’ll update you when I’m done. Onions, garlic, hard squash, potatoes: store in a dark and cool location (i.e. pantry or we have a lazy suzan that we store these in a wicker basket) *I learned from Imperfect Produce that Onions emit a gas that cause potatoes to sprout faster, store these separately. P.S. potatoes that have started to sprout are still safe to eat, just cut off the sprouts themselves. Avocados: until they are ripe keep them on the counter, once ripe store them in the fridge. Carrots: I only recently started storing carrots in a jar submerged in water and this really helps them stay fresh and firm! Bananas: store on counter, once these are ripe or overripe peel them and freeze them. We use a gallon Stasher bag to store bananas in the freezer (compost the peels) and use them in smoothies or to make banana bread or banana pancakes. Tomatoes: keep these on the counter! If they are fully ripe and you prefer them cold, then I suppose you should refrigerate them. Oranges, Grapefruit, Lemons, Limes: keep these on the counter or to slow ripening, in the fridge. Fresh herbs like cilantro & parsley: cut off ends and store in a glass jar with water. Some people recommend to cover the top of the herbs with a plastic bag. We don’t use plastic bags so we just leave them uncovered and they seem to last at least 7 days. Leafy greens: this is where the Jar Method I mentioned above taught me a lot. If you wash, dry, and cut your greens you can keep them in a glass jar (big mason jar) with a little towel at the bottom to absorb moisture and they will last you almost 4 weeks! Quick product review! I purchased the SWAG produce bags a while back which claim to keep produce fresh longer and I haven’t had much luck with them. I still use them occasionally but I feel like glass containers keep food fresh longer and are better for storage because you can see everything. You know I’m a huge fan of composting! If you’re curious about why this is important, go here to checkout my blog post more about this. This is a HUGE component in my life for reducing food waste. I don’t have quite enough time on my hands to save all my scraps for making veggie or chicken broth (even though I wish I did that! ), so composting is very important to me. It’s amazing how once we started composting our amount of overall trash significantly reduced. We are lucky enough to have a community compost program, so we collect all our food scraps (anything that was once living) and they get processed by a nearby facility into compost that is used in local gardens/ farms to grow plants and produce! This allows what would normally be waste, to go towards something useful and beneficial for our community. 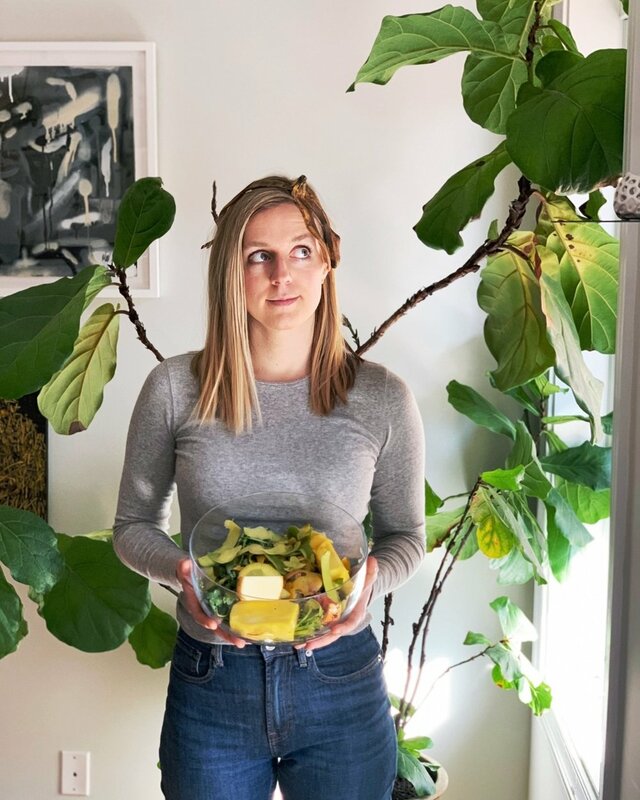 I highly recommend you listen the episode from one of my favorite podcasts Live Planted about composting, find the episode here. There are many different modes of composting and Alyssa simplifies it for us. Gotta love that! Let me know if any of these tips help you or if you have any other food waste fighting tips to share!